Dubai, UAE, November 16, 2016: Scent is a form of expression for each of us. It showcases a person’s individuality, and can bring an air of confidence to any person’s style. Bold and heavy-hitting, but also persistent fragrances, are what women in this region look for when it comes to making a long-lasting, olfactory impression. And, when it comes to laundry, there is no difference! We love infusing our clothes with a unique and long lasting freshness. And, to enhance the freshness of our clothes for a SCENT-sational experience, Downy has created Unstopables, a revolutionary scent booster delivering an art palette of scent that transforms the chore of laundry into a way for each person to make a long lasting bold expression. Downy invited two of the region’s most renowned lifestyle influencers to put the new Unstopables to a “freshness challenge.” Taim Al Falasi and Rawan Bin Hussain enjoyed a full day in Dubai together, exploring the extravagant spice souk and stopping for tea. New Downy Unstopables accompanied them on this journey, offering their clothes an exceptional boost of freshness, despite the long day. New Downy Unstopables puts scent alchemy in your hands, enabling you to select your personalized scent intensity by shaking in a few or a lot of beads into each wash. This special form is easy to use. All you need is to use your detergent as usual to give your clothes a deep down clean and add your favorite Downy concentrate variant to soften, freshen and protect. Finally, drop the Unstopables beads directly into the drum of your washing machine at the start of the wash, prior to adding your clothes, to boost freshness for up to 12 weeks**. The scented beads dissolve during the cycle to infuse the fibers of your clothes with delicate scents for long-lasting freshness. The new Downy Unstopables range offers three exhilarating scent variants, which combined with current Downy liquid fabric softeners, gives your laundry a complete, customized freshness. 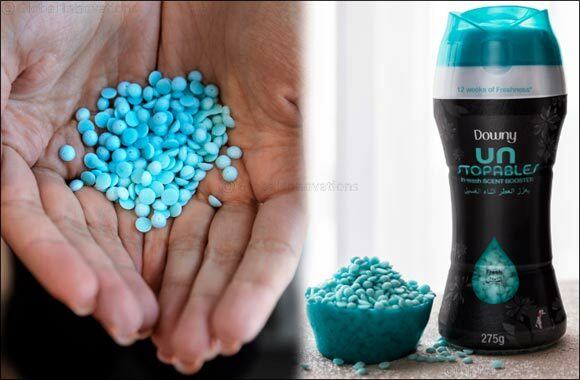 Downy Unstopables “Fresh” is an invigorating marine scent, infused with green citrus aroma and sweet soapy back notes. Downy Unstopables “Shimmer” combines the floral and fruity notes of Jasmine and red berries with a delicate touch of peach aroma. Downy Unstopables “Glow” holds a peachy, gourmand fragrance infused with creamy tonic vanilla notes overcome with caramel. Thanks to new Downy Unstopables, a fresher world of scent is waiting to be discovered. Unstopables is now available at leading retailers across the region.